We all run a race moving with the blessing of God, but suddenly we crash into a wall, which can be a wall of illness, or financial difficulty, or spiritual failure or family problems. This can bring discouragement to anyone, to the point of being tempted to surrender. They are difficult times, leading us to ask what we did, others will want to blame someone else, or blame God, or look at their circumstances and say: why? If we go to the Word of God, specifically in the Book of Acts, we will find a story about the Apostle Paul, in Chapter 14: 7-22 "But when the Jews and the Gentiles, together with their rulers, threw themselves into affront and to stone them, knowing it, they fled to Lystra and Derbe, cities of Lycaonia, and to the surrounding region, and there preached the gospel, and a certain man from Lystra was sitting, unable to walk, lame from birth, who had never walked. He heard Paul speak, and fixing his eyes on him, and seeing that he had faith to be healed, he said with a loud voice, "Stand up straight on your feet." And he jumped, and walked. he had done, he raised his voice, saying in the Lycaonian language: Gods under the likeness of men have descended to us, and to Barnabas they called Jupiter, and to Paul, Mercury, because this was the one who spoke, and the priest of Jupiter, whose temple was In front of the city, he brought bulls and garlands in front of the gates, and along with the crowd he wanted to offer sacrifices. When the apostles Barnabas and Paul heard it, they tore their clothes and threw themselves into the crowd, shouting and saying: Men, why are you doing this? We are also men similar to you, who announce to you that from these vanities you turn to the living God, who made the heavens and the earth, the sea, and everything that is in them ….. And saying these things, hardly They managed to prevent the crowd from offering them sacrifice. Then came Jews from Antioch and Iconium, who persuaded the crowd, and stoned Paul, dragged him out of the city, thinking he was dead. But surrounding him the disciples, he got up and entered the city; and the next day he went out with Bernabe to Derbe. And after announcing the gospel to that city and making many disciples, they returned to Lystra, Iconium and Antioch, confirming the disciples' encouragement, exhorting them to remain in the faith, and saying to them: It is necessary that through many tribulations let's enter the kingdom of God. " As we observed, Paul arrived at Lystra and Derbe where they preached the good news, there was a miracle where a cripple was healed, however, they stoned him, got up and continued to preach. Surely Paul, did not understand exactly why preaching and doing miracles could then be stoned to the point of almost dead. It must have been a time of discouragement. And it leads us to ask ourselves, what did Paul have to do to get up? How did he recover his spirit? 1. His conversion to Christ. He would never forget his conversion when he met Jesus Christ. Acts 9: 4-6 "'And falling to the ground, he heard a voice saying to him," Saul, Saul, why are you persecuting me? "He said," Who are you, Lord? "And he said to him," I am Jesus, to whom you persecute, it is hard for you to kick against the sting. "He, trembling and fearful, said," Lord, what do you want me to do? "And the Lord said to him," Get up and enter the city, and you will be told what it is and what you must do." That was unforgettable. Jesus saved him, sent him to a certain place, told him who he should talk to and told him what would happen in his life. And of course his blindness was taken away from him and he began to preach the gospel. So when you are discouraged remember the day Jesus saved you. He saved you for you to keep going. That day your sins were forgiven, that day you became a child of God. Remember that no matter what you face in life, or whatever happens, you are saved by the Grace of God. Also your name is written in the Lamb Book. Just praise God, because when you praise him, discouragement can not continue. 2. Your conviction about the purpose in your life. Philippians 1: 15-17 "Some indeed preach Christ out of envy and strife, but others of good will." Some announce Christ out of contention, not sincerely, thinking of adding distress to my prisons, but others out of love, knowing that I am placed for the defense of the gospel. " Pablo, when he was stoned, could have said, I can not stand it anymore, it does not matter anymore. But it was agreed that Jesus Christ had chosen him to have a purpose and a sense of direction, to preach the gospel of the Lord Jesus Christ. Like Paul, you were called, chosen by God, saved by God and given a conviction in your life, to represent the life of the Lord Jesus Christ. You have a testimony and no matter what passes, God is preparing you to give an answer to others who are going through the same kind of situations. 3. His amazing confidence on the Almighty God . Romans 8: 35-39 "Who will separate us from the love of Christ? Tribulation, or anguish, or persecution, or hunger, or nakedness, or danger, or sword?". As it is written: " For your sake we are all dead. We are counted as slaughter sheep, but in all these things we are more than conquerors through him who loved us, for which I am sure that neither death, nor life, nor angels, nor principalities, nor powers , neither the present, nor the coming, nor the high, nor the deep, nor any other created thing can separate us from the love of God, which is in Christ Jesus our Lord. " GET UP. If you are discouraged, you have the right to get up. And you get up based on the confidence of what God has placed in us. That no matter what you face, nothing can separate us from the love of Christ. Could anyone say, and what if Paul had died?. Well, absent from the body and present in the Lord. Paul had a sense of extraordinary conviction and confidence and that no matter what happened, he would rise up. You may say, but God has not put me to preach the gospel. Let me tell you, God saved you so that you would walk in a personal relationship with Jesus Christ, so that anyone who knows you, knows Him. According to this, you also have a purpose in your life. Apart from going to heaven, you are impacting the lives of other people you do not even know. 4. His trust based on the promises of God. Joshua 1: 5 "No one will be able to meet you in all the days of your life, as I was with Moses, I will be with you, I will not leave you, nor forsake you." Discouragement, does not mean that you are not a Christian, but that as a believer, even when we are discouraged, we rise again based on the promises of God. I will not leave you, nor forsake you. I'll go with you. 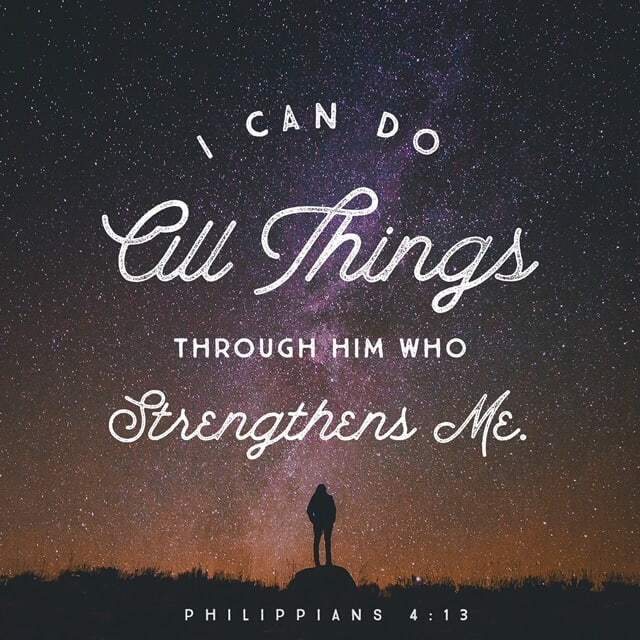 I can do everything in Christ who strengthens me. Jehovah is my Shepherd and nothing will be lacking. 5. His motivation for who dwells in him and who is capable of helping him at all times. In this case, Paul was aware the Holy Spirit dwelt in him, who also filled him with courage to overcome hardship and pain. 2 Corinthians 5: 5 "But he who made us for this very thing is God, who has given the earnest of the Spirit. " The Holy Spirit came as a guarantee that it is always in you. That He gives you power for whatever you need in life. The guarantee that gives you direction in life. And the guarantee that we always have his presence in us. So those who feel discouraged, it is time not to be discouraged, pray and rise: "Heavenly Father, today I come before you to ask you first, forgiveness for all my sins, I know I do not have to be discouraged, you saved me, you gave me your Holy Spirit, you gave me a purpose for my life, so I should not be discouraged, I stand up in your name Lord Jesus, to fulfill what you want me to do. I declare the power of the Holy Spirit on me, right now, in the name that is above all the name, Jesus Christ, amen. "